A common question, and rightly so, as it is an important topic! Naturally you do not want to get malaria, however, many anti-malarial drugs are expensive and can have unpleasant side effects. Here we try to provide you with all of the relevant information so that you can make an informed decision. simply look at a map produced by the World Health Organization​and advise you based on this. These maps are often out-dated. The last malaria epidemic in South Africa was during December to February 1999-2000. Since then, South Africa has used radical methods to eradicate malaria once and for all, with the objective to be completely malaria-free by 2018. 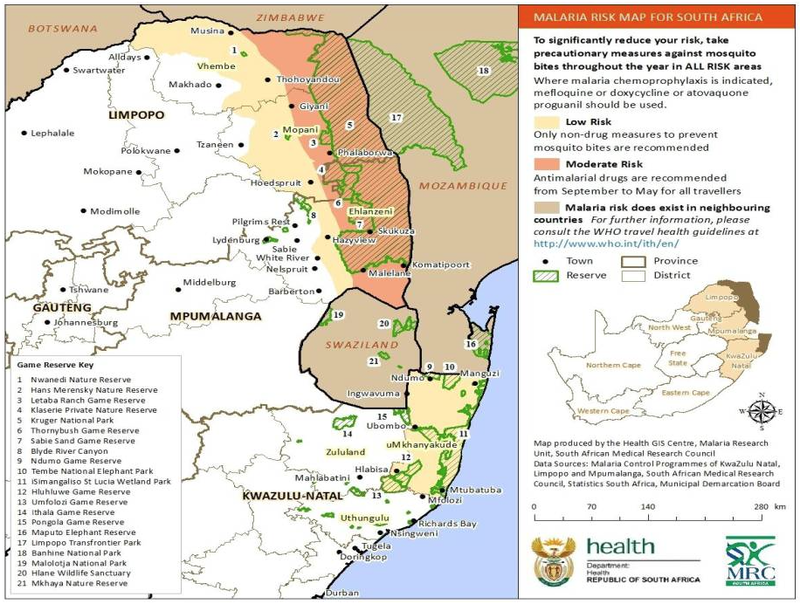 In 2014, a new malaria map was issued by the South African Department of Health. This is shown below. Currently malaria still occurs in isolated areas in the Northern parts of South Africa. For example, in Kruger, you have a small chance of contracting malaria. To reduce this risk you can sleep under a mosquito net and apply insect repellent containing DEET, and from September to May it is advisable to use anti-malarial drugs. St. Lucia has been free of malaria for 15 years, and throughout the rest of KwaZulu-Natal (including the Elephant Coast) malaria is practically non-existent. Occasionally there are some cases reported in the North of the province, near Kosi Bay and Tembe. Often these stem from a person having travelled to Mozambique a few weeks earlier, where they contracted malaria, yet only exhibited symptoms once in South Africa. It is because of these few cases from Mozambique that the Elephant Coast has a Low Risk status on the map. The risk is thus negligible, which is why the Ministry of Health discourages the use of anti-malarial drugs for visiting the region. ​​on the map above. Swaziland and Mozambique, however, have a joint malaria eradication program with South Africa. As a result the whole of Swaziland and part of Mozambique south of Maputo, are in the Low Risk zone for which anti-malarial drugs need not be used. The Northern Cape, Cape Town and the Garden Route are all malaria free destinations. As previously mentioned, we would like to refer you to your GP or the National Health Service, as we may not provide medical advice. Should you not wish to take any chances you may ask your doctor to prescribe you anti-malaria drugs. However, we ourselves do not take any anti-malaria drugs and live in South Africa. This is because we consider the risk to be negligible. Source: http://www.amayeza-info.co.za/?page_id=496 or download the scientific publication here.